Pitmaster Josh Cary and Chef Tom Jackson talk about the “Vegan’s Nightmare,” the Turducken and Tom gives step by step instructions to cook one yourself! Brown the sausage in a 12” cast iron skillet. Remove the sausage from the skillet when cooked through, but leave behind the rendered fat. Add the leeks and carrots and cook until the carrots are tender. Add the garlic, thyme, sage, rosemary and chili flakes and cook another minute, stirring. Add the wine to deglaze. Cook until the wine is almost completely reduced down. In a mixing bowl, combine the dried bread and sausage mixture. Mix well. Slowly add the turkey stock until the stuffing is completely moistened, but the bread cubes still hold their form. Add the eggs and mix well. Debone the chicken, starting by cutting alongside the backbone and following the rib cage around to the breastbone. Do the same from the other side of the backbone. Remove the flat of the wing completely and save for another cook. Cut around the bone of the wing drum, working your way toward the knuckle. Pull the bone out and slice free. Next, debone the thigh. Slice along the thigh bone, down to the joint where the thigh meets the leg. Slice around the bone until it is freed. Then, slice around the knuckle of the leg drum, scraping the flesh away from the bone and working your way toward the end of the leg. When the bone is exposed enough to grab ahold of, pull it until it turns the meat of the leg inside out and slice the tendons to free the bone. Discard all bones. Repeat the deboning process on the duck. Repeat the deboning process on the turkey, with two exceptions. Leave the wing bones and leg bones in place. Season the flesh with your favorite poultry seasoning. Place the turkey skin side down on your prep surface. Press a layer of stuffing over the meat, distributing evenly across the surface. Lay out the duck, skin side down, on top of the turkey. Season the duck with your poultry seasoning. Press a layer of stuffing over the meat, distributing evenly across the surface, and filling the leg and wing cavities. Lay out the chicken, skin side down, on top of the turkey. Season the duck with your poultry seasoning. Press a layer of stuffing over the meat, distributing evenly across the surface, and filling the leg and wing cavities. Pull the sides together, meeting where the backbone once was. Sew up the cut along the backbone using butcher twine and a large needle making sure to go through flesh as well as skin, so it will not tear out. Sew up the ends (top and bottom cavities), to keep the filling from spilling out. Place the turducken on a cooling rack over a sheet pan. Place in the refrigerator to dry out the skin overnight. The next day preheat your grill to 350ºF setup for indirect heat. 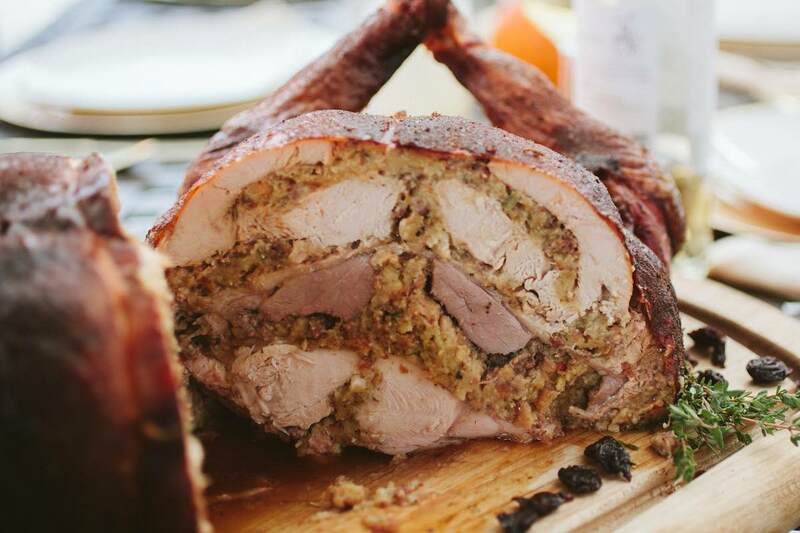 Remove the turducken from the refrigerator. Rub a thin layer of oil over the skin. Season the skin with your poultry rub. Cook the turducken on the cooling rack, over the sheet pan in your grill. When you achieve your desired color on the outside of (3-4 hours into the cook), tent a large sheet of foil over the turducken. Continue cooking until the internal temperature reaches 160ºF. Rest 20 minutes before slicing to serve.